Don’t say we never treat you for it’s competition time again here on Pies! 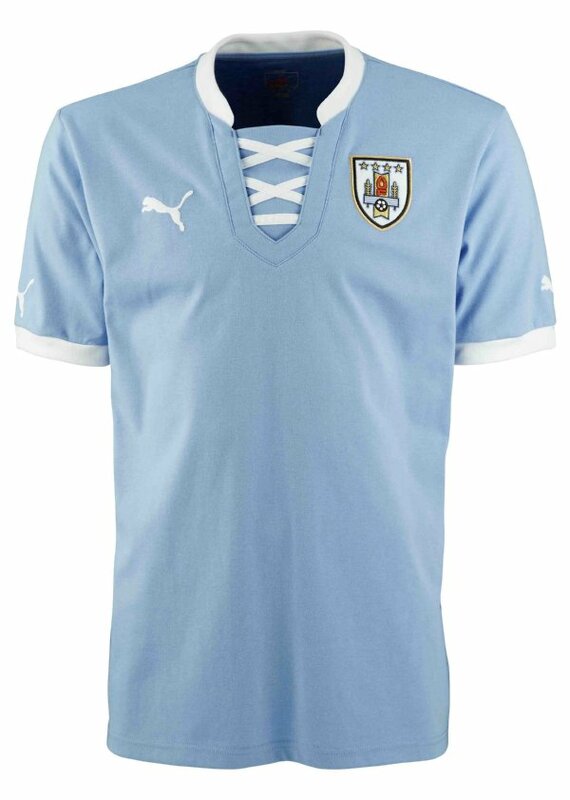 Hot on the heels of Italy’s new Confederations Cup clobber, PUMA have today unveiled the kit that Uruguay will be wearing at the tournament in Brazil this summer, with the design paying homage to the strip that La Celeste wore when they took home the gold medals at the 1924 Olympic Games in Paris – hence the rather eye-catching lace-up neck. Along with the neck detail, the classically-styled kit is rendered in the colours of the Uruguayan flag and once again produced using nothing but recycled polyester, so it’s also as green as it is sky blue. Who did Uruguay beat in the final of the gold medal match at the 1924 Summer Olympics? Email your answer to us at waatpies@gmail.com and stick ‘URUGUAY COMP’ in the subject field. A winner will then be chosen at random from all the correct answers. You’ve got until midnight on Sunday (7th April). 1. All entries must be received by midnight (BST) on Sunday April 7th, winners will be notified by the following Tuesday at the latest. 6. PUMA® will not be liable for any prize(s) that do not reach the winners for reasons beyond PUMA®’s reasonable control. 7. The name, county and photograph of the winners may be used by PUMA® for post-event publicity purposes. 8. The winners agree to allow PUMA® to use their name and likeness for advertising and publicity purposes without additional remuneration.